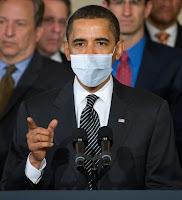 American president Barack Obama has declared that the H1N1 flu is a national emergency. Because more than 1000 people have died. So — and help me here — swine flu is an emergency when 1000 die, but global climate disruption is not an emergency when 300,000 are dying each year? I don't get it. According to the article I read, Obama's officials said the declaration "was a pre-emptive move designed to make decisions easier when they need to be made." Sheesh, sounds a lot like what the Kyoto Protocol was supposed to be all about — and what the Copenhagen climate talks (that Obama will probably not attend, even though he's going to be in Scandinavia to pick up his Nobel peace prize) are supposed to lead to. Apparently "many millions" of Americans have had swine flu so far, with 20,000 hospitalizations, according to an estimate from the Centers for Disease Control. All but about 1000 of these people have recovered, no problem. But millions of people are losing their lives and their livelihoods, their food security and their water sources, their homes and their entire homelands due to global climate disruption. But that's not an emergency? The world needs to get a grip (rather than la grippe — flu, in French) and declare that global climate disruption is a planetary emergency. Without that declaration, nations will not work together as a world-wide human family to safeguard the future. Mr. Obama has just proven how vital an emergency declaration is for implementing an action plan.